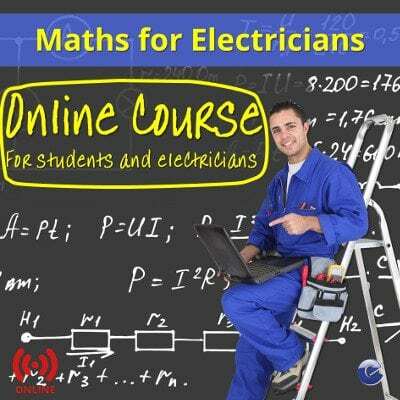 Maths for Electricians online course. Guides you through all the maths you need as a UK electrician. Hundreds of practice questions. Online maths course for students and electricians. All the maths you need as an electrician in the workplace or for your study in the classroom. Study on any internet connected device. Full of clear equations and calculations supported by examples and hundreds of practice questions. The course does not require you to have a background in mathematics, it covers topics from first principles to complex three-phase circuits. At each step of the way the topics explain clearly how to understand the components of the equations and how to combine them into solutions. The course is divided into lessons with separate topics covering equations and concepts in details. Every lesson is accompanied by practice questions designed to give students and electricians the confidence to apply the maths learned. The course has been designed specifically to assist students taking City & Guilds exams including: 2382-18 (18th Edition Wiring Regulations), 2391-50, 51 and 52 (Inspection and Testing) and 2365 (Electrical Installations Technology). Course remains available to students for 12 months from date of purchase.